ESA/ATG medialabAn artist’s rendering of the Philae probe on Comet 67p/Churyumov-Gerasimenko. Gas jets from inside a comet hosting Europe’s Philae lander may launch the hibernating probe out of its ditch and back into sunlight for a battery recharge, a former mission manager said on Monday. The European Space Agency’s Philae lander wrapped up an unprecedented 57-hour mission on the surface of Comet 67P/Churyumov — Gerasimenko on Saturday. The washing machine-sized spacecraft, which was released by its orbiting Rosetta mother ship on Thursday, ended up in a ditch after bouncing off the comet’s surface. 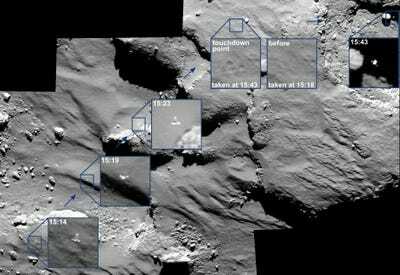 A camera aboard Rosetta, which flew less than 10 miles above the comet’s surface, captured the final minutes of Philae’s descent, bounce and drift across the comet’s face, pictures released by the European Space Agency on Monday showed. The unintended bounce, a result of Philae’s harpooning ice screws failing to anchor into the surface, left the lander in a ditch, shielded from the sun needed to charge its battery for an extended mission. Scientists anxiously waited as Philae hustled through an automated series of experiments — including drilling in the comet’s body — and, against the odds, survived long enough to radio results back to Earth. ESA/Rosetta/MPS for OSIRIS Team MPS/UPD/LAM/IAA/SSO/INTA/UPM/DASP/IDARosetta took a series of pictures of the surface that saw Philae hop across the surface. Before shutting down, Philae shifted its position to try to catch more light on one of its solar-powered panels. The comet, nicknamed 67P, is heading toward the sun, accompanied by the orbiting Rosetta satellite. 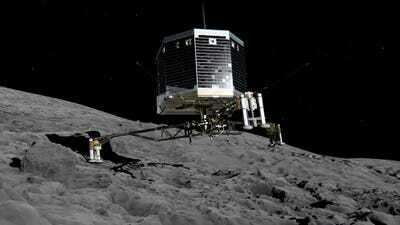 The increasing amount of sunlight may serve another purpose besides charging Philae’s dead battery. As the comet warms, it releases jets of gas, which could potentially hoist Philae out of its ditch. Gravity on the comet’s small body is about 100,000 times less than Earth’s, giving Philae the relative weight of a piece of paper. The comet’s surface was harder than scientists originally thought, which is partly why its harpooning landing system failed. Schwehm however said that may have been a blessing in disguise. “Perhaps it was good that (Philae) didn’t fire the harpoons because if they would not have penetrated you might have had a much bigger problem,” he said. Early results from the ongoing Rosetta mission are expected to be released next month at the American Geophysical Union conference in San Francisco.